-* For available data see Hawes1. Figure 1A: A snap-shot of the ERG system. Figure 1B: Close-up of the stimulator and the light filter holder. Figure 1C: The various individual filters used. Figure 1D: Light amplifiers and control units. Gold wire (99.9%), 0.508 mm (Jewelry Store) Gold loop electrodes for recording and reference; they are made by S. Nusinowitz, Visual Physiology Laboratory, UCLA, USA and consist of modified platinum electrodes to which a gold wire loop has been attached. Figure 2A: Close-up of the ERG set-up (red cable/electrode on the left = negative; red cable/electrode on the right = ground) with a heating pad in place. 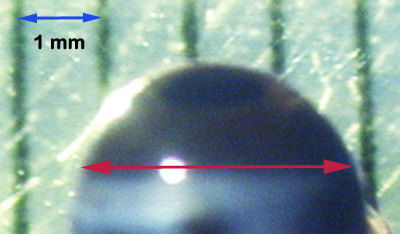 Figure 2B: Closer view of the corneal (positive) electrode. Figure 2C: The ERG signal amplifier. Figure 2D: Shows the out-put screen using customized software for data analysis. 1% cyclopentolate: for pupilary dilation. 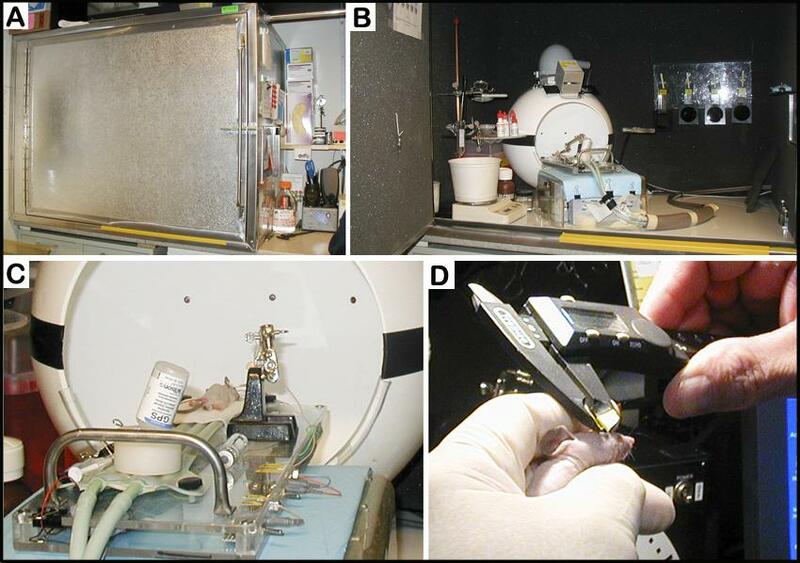 In general all mice are dark-adapted for at least 2 hrs before obtaining electroretinograms (ERGs). a. Visual inspection for gross eye abnormalities is conducted by examining the eyelids, the entire globe of the eye, the cornea, and the iris. b. Corneal clarity, size (buphthalmos vs. microcornea), surface texture, and vascularization is assessed using a Nikon biomicroscope (slit lamp) attached to a microscope with a 40x objective. c. The iris is checked for pupil size, maximal constriction with light exposure, reflected luminescence, and for the presence of atrophy and synechia (adhesion). d. Any observed abnormalities are documented with photographic images of the afflicted area. e. The eye is then dilated with 1% atropine and the lens is checked for cataract formation and pseudoexfoliation using a slit lamp. f. An indirect ophthalmoscope is used to examine the fundus for signs of retinal degeneration, such as retinal vessel constriction or retinal pigment epithelial disturbance, or for other problems, such as drusen or deposits, structural or optic nervehead anomalies, vitreal abnormalities, and/or abnormal vascularization, using 60 or 90 Diopter double aspheric lenses. g. Fundus photographs are then taken of the observed defects using a Kowa Genesis small animal fundus camera. a. 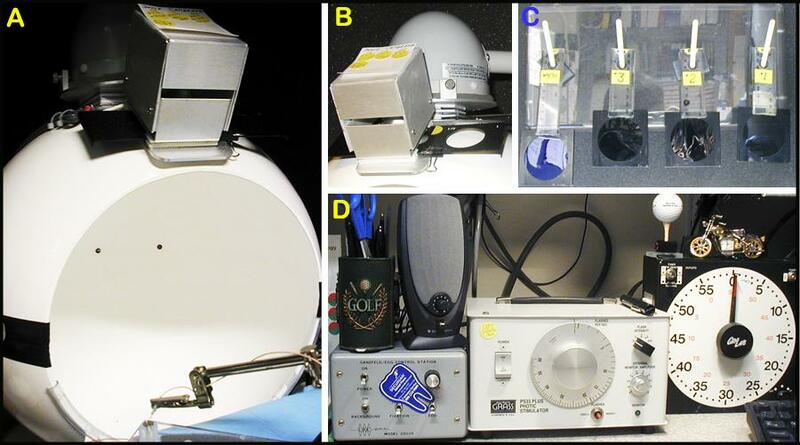 In preparation for the ERG, mice are kept in a dark room (dark-adapted) for at least 2 hrs. b. In the testing room light sources are turned off or covered with red colored transparent plastic. c. A red light bulb is used to illuminate the room. d. Mice are weighed, and 1 drop of Atropine and 1 drop of Cyclomydril (ophthalmic solutions) is applied to dilate the right eye (induce mydriasis). e. Long-acting anesthetic combination made up of Ketaset/Xylazine /saline solution is injected intraperitoneally (i.p.) at a dose of 0.1 mL/20 g bw. f. Once the pupil is dilated and the anesthetic agents have taken affect, the mouse is placed on a heating pad (38°C, Figure 2A). Figure 3A: Shows a custom-built dark-box in closed position during ERG testing. Figure 3B: Showing the ERG set-up and the dark-box in open position. Figure 3C: Shows a close-up of the ERG set-up staged for testing. Figure 3D: Shows the measurement of the eye diameter using a handheld caliper. Figure 4: Diameter measurement of the eye. g. Three electrodes are then attached: (1) the ground electrode is clipped to the tail, (2) the reference electrode is inserted in the mouth, and (3) the recording electrode is placed on the surface of the right cornea (see Figure 2 above). h. To moisten the cornea and assure electrode contact, 1 drop of Goniosol is applied. i. The rod test is performed with a short-wavelength Wratten filter (# 47A) using stimulation intensities of 1, 4, 8 (lumen sec/ft2), flash duration 10.25 s, and 0.2HZ frequency, see Figure 5 below). Figure 5A to 5C: Examples of light stimulus using different filter and light intensity. j. The subsequent cone test is performed with the Dome light 'ON'. k. The mice are allowed a 10-minute light-adaptation time. l. Cones are then tested with white flashes at flash intensities of 16, 8, or 4, at 1.0 Hz (see Figure 5 above). m. Following ERG recording, the electrodes are removed and the right eye diameter is obtained using handheld caliper (see Figures 3D and 4). Figure 6: Graphic examples of a normal rods ERG and cones ERG. The a-wave is the initial downward deflection and the b-wave is the subsequent upward deflection following light stimulation.The amplitudes of the waves are positively correlated with vision. Mouse electroretinogram (ERG): rods A and B waves, and cones A and B waves. Eye diameter.